It was a beautiful partly sunny day that was not as humid and not as windy as the last few, but the lower temperature didn't seem to calm the tempers as we moved toward the end of the Futures event in Boca Raton. Qualifier Adam El Mihdawy (right) and eighth-seeded Daniel Lustig played a marathon match. I'd like to say it was all about great tennis, however, it was also about great meltdowns. I've never been to a hockey match (for this very reason), but from what I've heard they are calmer. There was screaming, racquet-throwing and arguments (and yes, warnings & code violations) as they played through nearly three hours. I arrived at 4-2, with Adam's break decided. He held it and finished off with 6-3. In the second, it was Daniel who had the first break for 3-2 and it was enough for him to take the second 6-4. In the third, when you would have thought someone would have been worn out, the points got longer and more exciting as the screaming increased. Adam broke and held to 3-0, though the games were all long and two went to deuce four times. Daniel came back a bit and had a few opportunities, but Adam finished with a great match point and his first quarterfinal in a USTA Futures event. 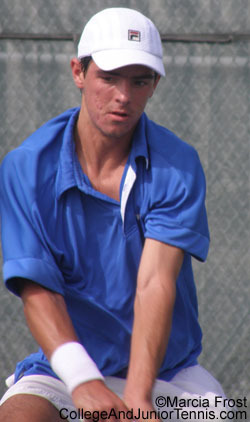 Alberto Francis (above) has had four more years on the pro circuit than Todd Paul and today that experience paid off. Todd, who has had a great showing in his brief career since Wake Forest, but he met his match in Alberto Francis today. Alberto was in command with his game, almost playing doubles as he charged the net after ever serve. 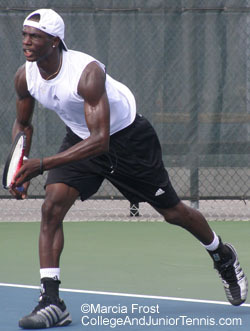 The second set was a big closer before he took it 6-2,6-4. Chase Buchanan is another qualifier who had a great run. 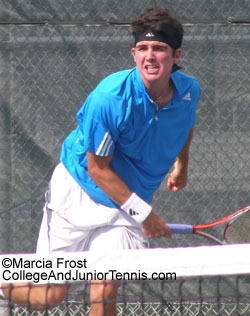 However, the 16 year old came up against fourth-seeded Ryler DeHeart (right) today, the University of Illinois graduate who has won seven titles since he hit the tour in 2006. Chase was broken immediately and managed to hold in the second after a long game. He had a triple break opportunity at 3-4, but that was it for the match. Ryler took the first 7-5 and then -- though there were some good points and close games -- shut out the second. In the rest of the singles matches, Gastao Elias upset top-seeded Ilija Bozoljac, 5-7,6-3,7-6(5) Milan Pokrajac defeated Amit Inbar, 6-2,6-3 Uladzimir Igantik won over Luigi D'Agord, 6-4,6-3 and Ricardas Berankis advanced over No. 2 Conor Niland. I was actually over to watch the latter, but when I arrived, Ricardas had won the first set and Conor was under the care of a trainer (blisters). He retired and the match did not resume. I got to see Adam El Mihdawy in a quite different marathon this afternoon. 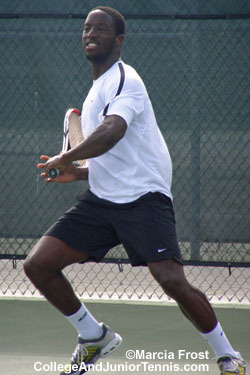 The pressure was not quite so high in the doubles match he teamed with Jarmaine Jenkins for against the Battistone Brothers, though it was certainly close. There was a lot more smiling and a lot less screaming on this court as Brian & Dann Battistone squeaked past 4-6,6-3,15-13, before they went on to eliminate Ricky Flach & Daniel Yoo (6-1,6-1). I spoke with Dann a bit about their two-fisted racquets. He told me they were made by a friend for "health reasons" and he loves them because he can have a great reach and the ability to hit a forehand on either side without changing his grip. The racquets haven't caught on beyond the Battistones, but they may after the success of these two. They will play their third final this weekend against Uladzimir & Andrey Kumantsov. 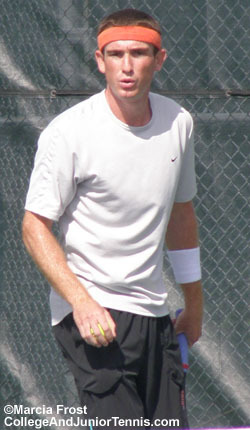 The USTA Pro Circuit Event at Boca Raton may have been a tough one for the players, but I really enjoyed meeting knew players and catching up with ones I hadn't seen in awhile (Marcus Fugate and told me all about his new training ground at the University of Virginia). I'm heading back to New York on Friday to start preparations on the Port Washington Winter Classic. 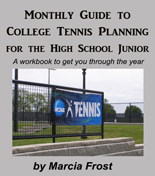 I'll also be speaking this weekend at the USTA Leadership Conference (College Tennis 101) so come by if you are in the area. P.S. 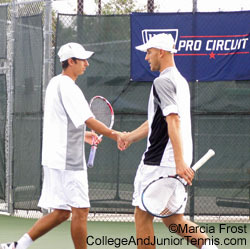 If you are interested in obtaining any photographs from the USTA Pro Circuit Event, contact Marcia@MarciaFrost.com.